Go back to the '80s with 38911 Bytes. With bands such as Crystal Castles currently helping to popularise the ‘8-bit sound´, Odo Synths may have released its 38911 Bytes software at just the right time. This is based on a Commodore 64 application, but comes with a number of additional features. 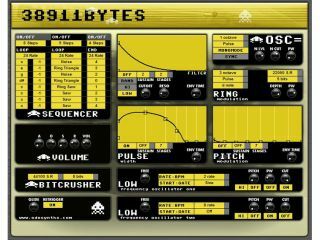 Looking suitably retro, 38911 Bytes is based on a single oscillator that offers saw, triangle, pulse and pitched noise waveforms. It has a built-in sequencer, a filter (with envelope) that offers low-pass, high-pass and band-pass varieties and pulse width and pitch envelopes. Also onboard are two LFOs, a ring modulator and a bitcrusher, while the software comes with 128 presets to get you started. A VST instrument for Windows, 38911 Bytes can be tried for free, though if you want to move any knobs you´ll have to make a donation. You can find out more and listen to an audio example of what the software can do at the Odo Synths website.